I would be amazed if Leanne Kitchen found a salad like this when she was travelling through Turkey. I absolutely love her book ‘Turkey Recipes and Tales from the Road’: the recipes are interlaced with gorgeous photos not only of the dishes themselves but the country and the people showing the Turkey that we know and love. As an aspiring photographer myself, I think they are excellent. But it wouldn’t be fair to say that this recipe is typically Turkish. The ingredients are very Turkish which is why I went for it, but the salad itself isn’t. When you are in a Turkish restaurant, the choice is usually a ‘mevsim’ /seasonal, or yeşil/ green salad. A salad is different from a meze, you see. Either is of course perfectly fine but it is always the dressing that lets both of them down. Invariably, you will be offered a choice of olive oil, lemon juice, or maybe pomegranate molasses that you add yourself. But the point is, you will never be able to make a real dressing if these ingredients are offered to you in this way. Salad dressing ingredients always need to be mixed/stirred/shaken together beforehand. 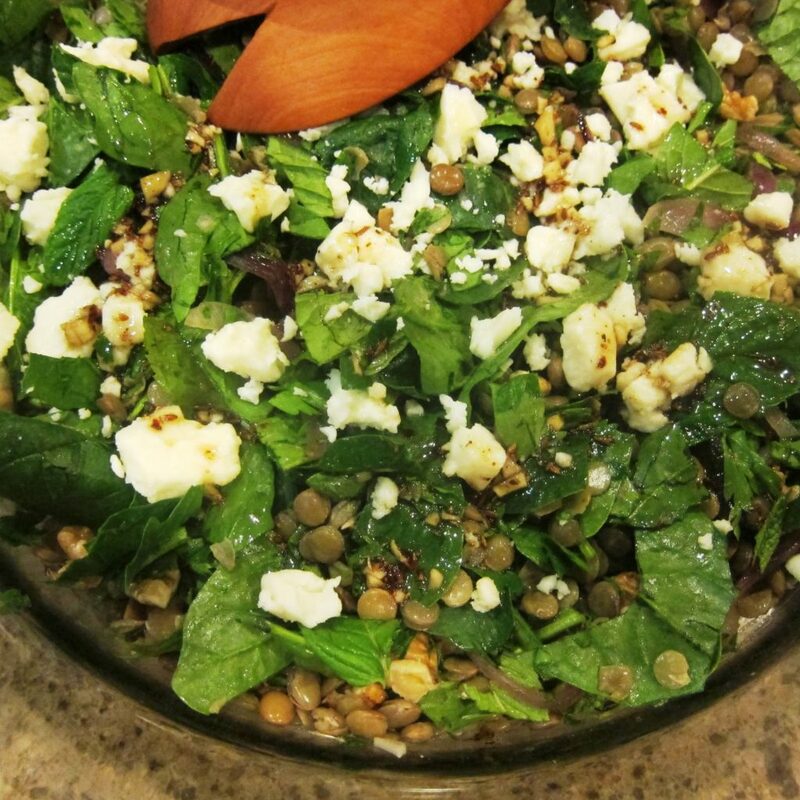 The dressing for this salad includes crushed cumin seeds – oh the aroma as they toasted! 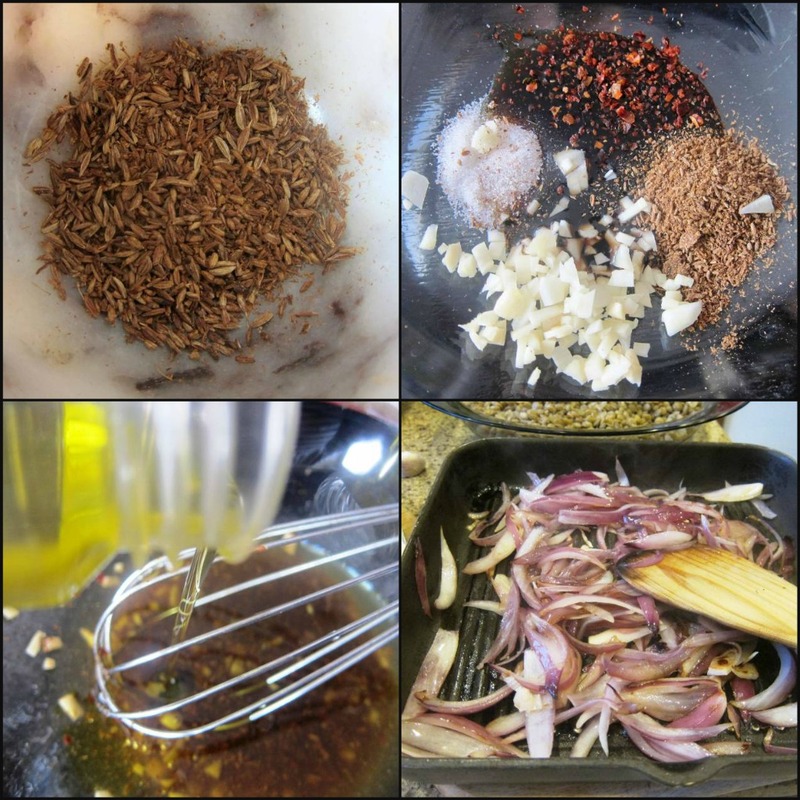 – and chopped garlic and what a difference that makes! I always make my dressings in a jam jar with a lid so I can give it a really good shake. We loved this salad: it would make an ideal meal for a vegetarian as it’s certainly nourishing, not to mention very tasty indeed. Just one glance at the ingredients should be enough to persuade you to make this salad. It was for me, anyway! I had just been to the market so all the greenery was as fresh as could be. Combined with the crunch of the walnuts, the subtle taste of the green olives and the slightly charred red onions not to mention that syrupy sweet-tart taste of the pomegranate molasses, this salad is a winner! The recipe makes a copious amount: serves 4-6. I would say more like 6! It also keeps very well in the fridge so long as you haven’t added the dressing. I actually divided it into two lots as there was so much, and kept one in a bowl covered with clingfilm. The leaves don’t wilt if they are not mixed into the lentils. dry fry the cumin seeds in a heavy-based frying pan over low heat, shaking the pan for 2 minutes or until fragrant. Use a mortar and pestle to coarsely grind the cumin seeds, then combine in a bowl with the garlic, pomegranate molasses, sugar and chilli, whisking well to combine. Whisking constantly, add the olive oil in a slow, steady stream, then whisk in the lemon juice. Season with sea salt and freshly ground black pepper and set aside. Put the lentils in a saucepan and cover with cold water. Bring to the boil, then reduce the heat to low, partially cover the pan and cook for 25-30 mins or half that time if they were soaked overnight, or until just tender. Take care not to overcook or they will be mushy. Drain well and cool to room temperature. Meanwhile, heat a chargrill pan to medium. Cut the onions in half lengthways then cut each half into 5mm/¼ inch thick wedges. Gently combine the onion with the oil, tossing well to coat. Cook the onions, in batches, 3-4 minutes on each side, or until tender and lightly charred. Remove from the heat and cool. 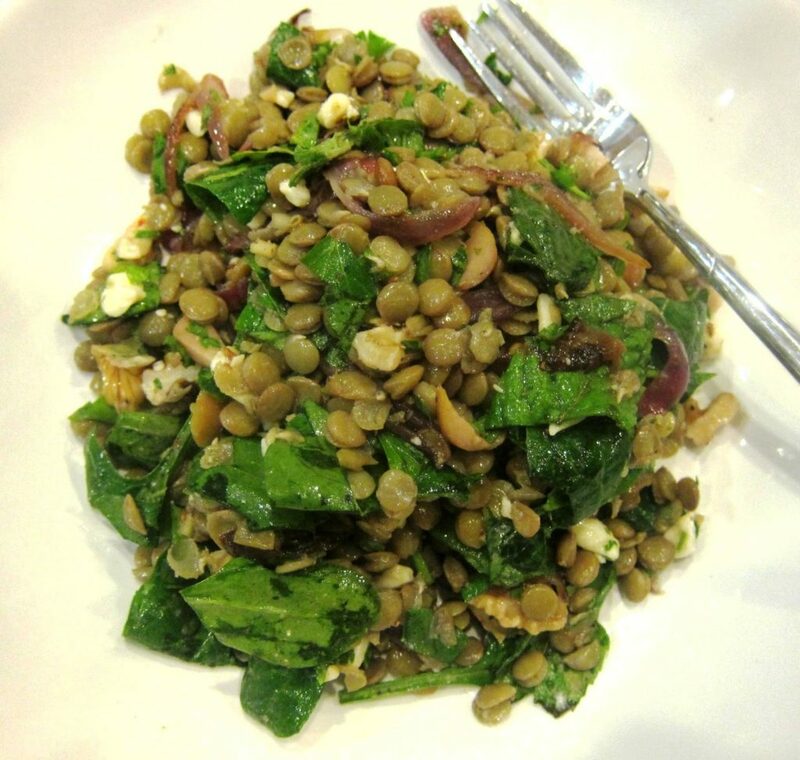 Combine the cooled lentils, onion,walnuts, olives, parsley and mint in a large bowl and add the spinach leaves. TIP roughly chop both the mint and spinach leaves. Season with sea salt and freshly ground black pepper. Toss gently to combine. Divide among serving bowls, top with the white cheese/feta/beyaz peynir and drizzle the dressing over the top just before serving. 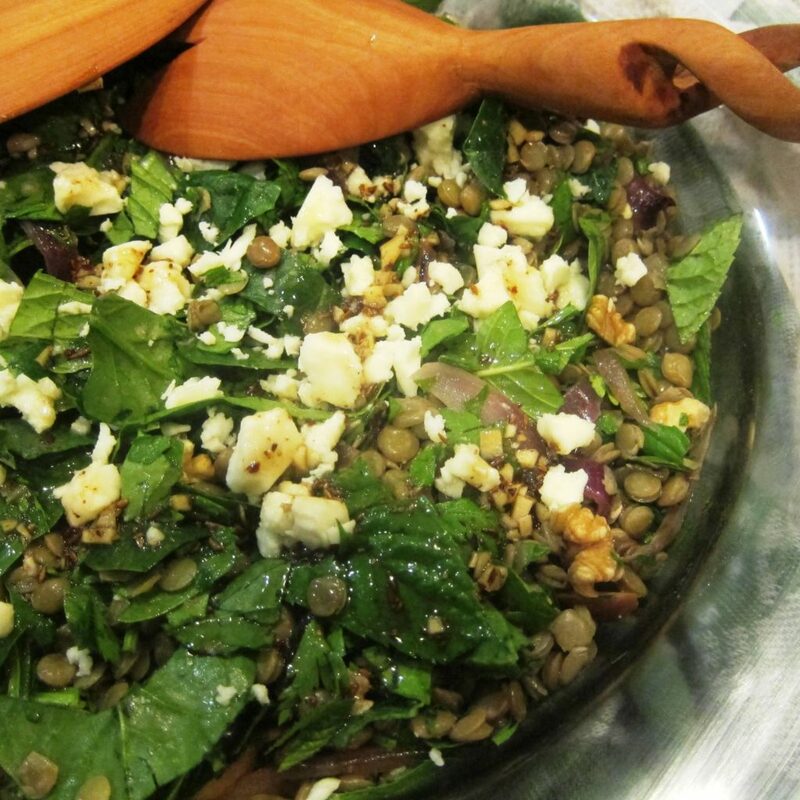 A meal in itself: why not try this healthy salad for lunch today? It’s got a lot going for it!